Do you send out the same CV for every job you apply for or write a new for each application? Do you list ALL your previous experience or do you edit for laser focussed relevance? Do you write your CV with the person you want to read it in mind? You should. It’s more than just being succinct (two sides of A4 is enough!) and the relevant information being easy for me to access, it’s about writing your CV specifically for your target audience each time. Have you ever been to see a band live that you’ve loved for years only to be disappointed that they just played stuff from their new album and not the hits you wanted to sing along to? The audience of diehard fans were bored just four songs in when this happened at a gig I went to – we had no emotional connection to the new music. I even saw one woman yawn – at a rock gig! The band hadn’t planned their show with their audience in mind. Big mistake. 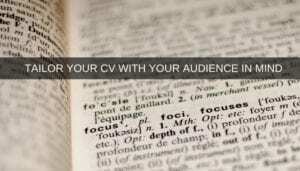 Your CV is your show. Approach it with your target audiences in mind. That’s deliberately audiences plural by the way. More on that to come. First, let’s look at your CV. Most of the CVs that I see are neat, they are professionally laid out with nice fonts, they rarely have typos or grammatical errors and they list a whole bunch of impressive stuff. Most weren’t written specifically for me though or even with the position advertised front of mind. Make sure that yours is different. The CVs that seek to address a recruiter’s urgent hiring requirements are the CVs that get noticed. So … How do you write a CV with your audience in mind? If you have a job advert then you have a head start. Highlight the things that the hiring organisation says that they are looking for and then highlight relevant experience in your CV that proves your suitability. When you come to write your CV make sure that those elements jump off the page. If you don’t have a job advert put yourself in the mindset of the company you want to work for. Based on your knowledge of their operation, make a list of what will they be looking for in a Project Manager and signpost clearly where your experience matches. Hirers don’t recruit based on the list of places where you’ve worked but on the competencies you have displayed whilst there which you could bring to benefit them. Many applicants think they’ve done this by scattering every ‘hot’ word they can think of throughout their CV… WBS, PIDs, Gantt, Stakeholder Management, Budgets, Communications, Team Leadership, etc. Well that’s fine but if the gig you’re after involves managing remote vendors providing project management as a service and your most recent experience boasts of how great you were managing an in-house team you might not get called in for an interview. This is where the bingo analogy comes into play. In bingo you win by matching the specific numbers on the balls to the numbers on your card. If they don’t match – you don’t win. When you start to think about matching your competencies with the needs of the recruiter in this way you increase your chances of progressing. If you’re reading this in the UK compare a paper copy of the Daily Mail with the content on the newspaper’s website. It’s a great example how the same organisation approaches different audiences with content that is appropriate for them. These days, your CV has to appeal to more than one audience as part of your application for the same job and this is where your CV bingo really pays off. During the application process, your CV will have to typically impress three types of audience. i) The Applicant Tracking System. The first is a machine. The second is a person but it’s someone who may or may not have job specific knowledge themselves, their role is to make sure that the machine was right about your suitability. The last audience certainly will have specific job knowledge, it is probably the person who placed the ad and they will be on the hunt for what you can offer them. That’s quite an eclectic audience to satisfy with just one document but satisfy them you must or your CV might not even reach the decision maker! Make sure that you check the criteria requested on the job ad against the experience listed in your CV – even use the same language as the job ad. Finally – check your spellings – when one PM’s applications regularly failed we went through his CV and found that it was a simple but costly typo – it turns out no Applicant Tracking Systems were looking for a “PRINC2” (sic) Practitioner – who knew!? 3 – Are Your Interests Of Interest? The interests section of your CV is often not given the care it warrants. Think about it – much of your CV is likely to be the same as hundreds of others … PRINCE2 … experience of Agile etc., etc. A great opportunity for you to stand out is in your interests. If, in your spare time, you run a junior football team and use your excellent organisational, planning and time management skills – mention it. If, as a school governor, you demonstrate good communication and negotiation skills – mention it. If you employ logical thinking and creative problem-solving skills in your work with the parish council – mention it. Your interests section is a window into your life – don’t squander it – what you do in your spare time could the thing that sets you above your competition! None of this is rocket science and the really good news is that, as Project Manager, you are brilliant at it already. You tailor communications about your project in a way that is relevant to the recipient every day – you wouldn’t use the same tone and content addressing the board that you would in an email to end users, for example, they’re different audiences! Treat your CV in the way you approach project communications. 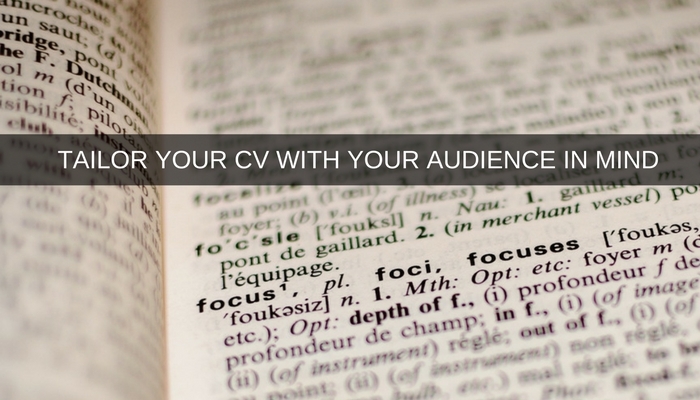 Next time you write your CV – think of your audience – if you want an encore.